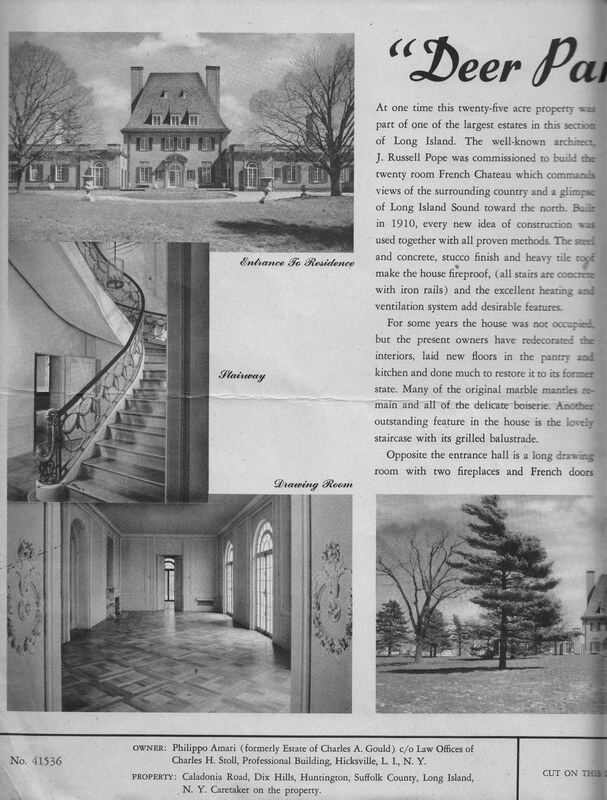 A brochure advertising 'Chateau Ivor', the Charles A. Gould estate designed by John Russell Pope c. 1908 in Dix Hills, with landscaping by the Olmsted Brothers. Gould, an accountant from Buffalo, organized a steel coupling manufacturing company named the Gould Coupler Company and was also in charge of the Gould Realty Company which had numerous land holdings in New York City. Click HERE for more on 'Chateau Ivor'. The house has since been demolished but click HERE to see where it would have stood on google earth. Brochure from the Gould family collection. I can't decide if I love it or hate it- the central block appears tall to the point of ungainly and the wings out of proportion. I think i love it though. But what a location. I never have resolved the great contrast between the main block and the wings and cannot help but think a different roof scheme all together might have made a difference. There was the minimum (or less) of closets, but that could have been worked out. Here's a bit more on Chateauiver. Isn't this just the ODDEST house? Beautifully detailed, elegantly conceived, and completely strange. 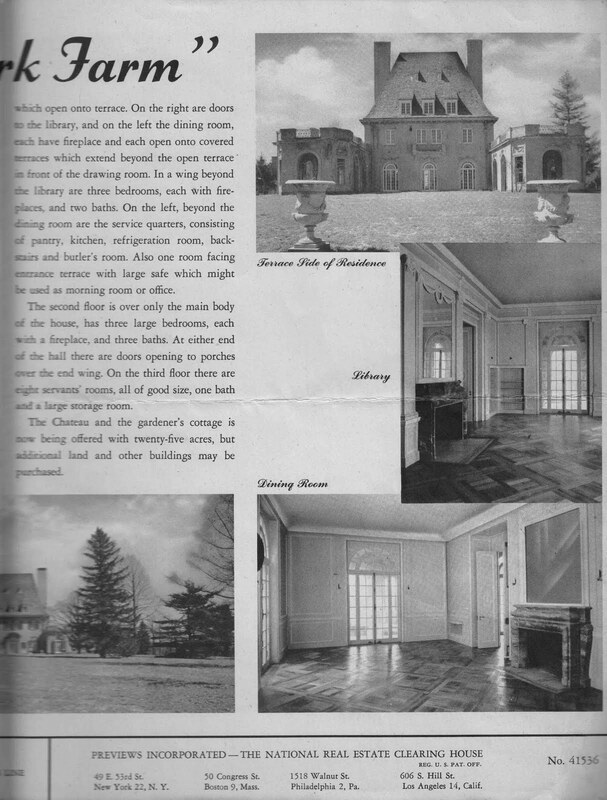 Pope designed a very similar house at Bar Harbor for Evalyn Walsh McLean (owner of the Hope Diamond), which was never built, Mrs. McLean choosing instead to enlarge and remodel the existing house on the site. I mention this because the drawings were published in Architectural Record in 1911, and show a more evolved version of the design, better proportioned, which sort of blends his best French house, the Moses Taylor house in Portsmouth RI, and Chateauhuiver. The drawings can be seen by clicking the link below. It's rather as if Pope said 'let's try this again, and see if we don't get it right this time'. Interesting if only because its unique and for that I can appreciate it being outside of traditional expectations. Does the design work? I cannot say to my eye that it comes off as charming or even terribly regal. I wonder if Pope viewed this as an exercise to keep a client happy. 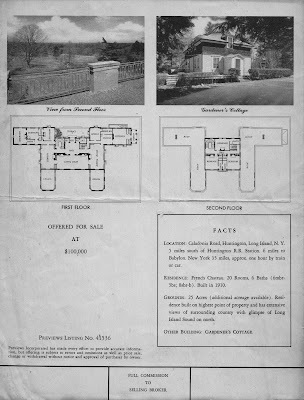 Harrie Lindeberg in 1916 executed a lovely home in Lake Forest IL - Wyldwood - for Clyde M. Carr that is far more pleasing to the eye. It has that same tall French chateau center hall at its core but didn't so naked with its wings. I must admit that I love the eccentricity of that madly elevated roofline, sort of Louis XV on acid, no? 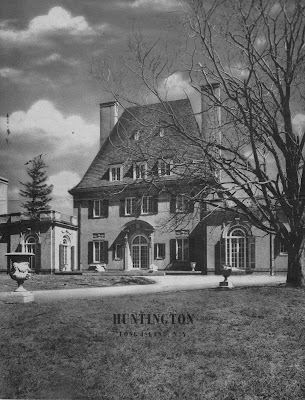 Interesting to compare this also with Pope's neo-classical English design for the Ogden Mills house at Syosset---sort of the same thing, only without the mad roof. If you read from "The Acient's" link, it sounds as if it was planned to be much larger than it was..20 bedrooms? I am fortunate enough to be in possession of a number of photos of Ivor showing it from mid-construction through life as the Gould residence. Much more to follow on the estate in the coming weeks. Page 442 Recent Works of John Russell Pope - page 468 covers Gould. Other L.I. estates plus McLean's Washington D. C. home. Updated HistoricAerial link showing house still standing. I think the roofline is fantastic and I love it...not that my opinion matters. In examining the floor plan, it appears that the first floor bedroom at the end of that wing (on the left) can only be accessed by walking through another bedroom or a bathroom. That can't be right, can it? Quirky look with a very traditional plan. 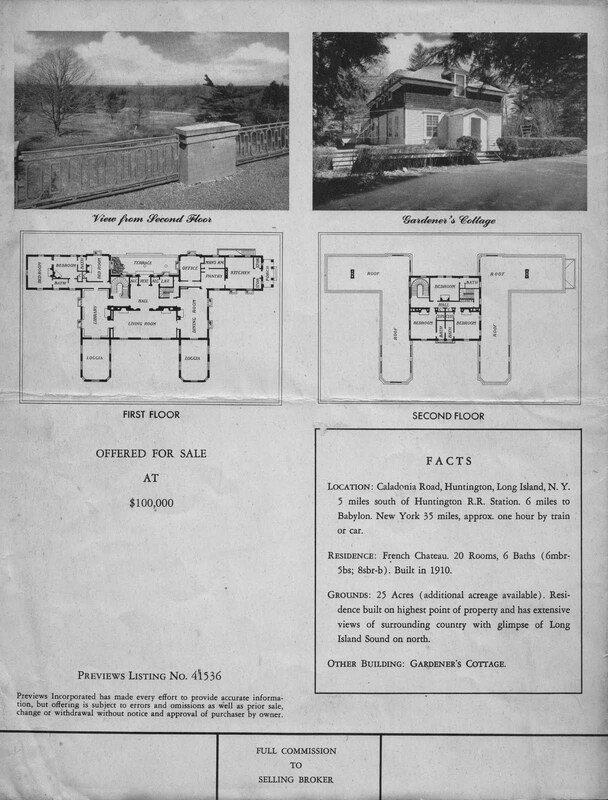 The brochure mentions that the property was originally part of a much larger estate. Anyone know what larger estate? 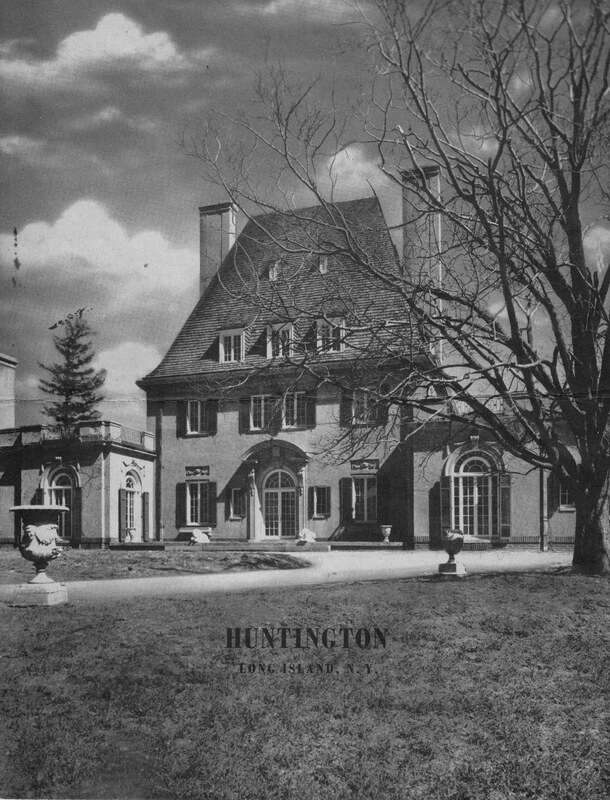 The Garrison book mentions 1,000 acres but no name. I Googled the name of the then current owner (on the brochure) - Philippo Amari, and found Filippo "Phil" Amari prominent Jersey mobster c. 1930s-50s. I'm guessing it's the same guy. Hello, I live on what used to be the Chateau d’Iver property, so I have an interest in it. I appreciate the information & comments on your site, it's very hard to come by any info on this place, even online. Based on some maps from 1909 & 1917, the actual exact location was in the area enclosed by Caledonia Rd., Deer park Ave., & Wolf Hill Rd., except for 3 areas inside that perimeter (a cemetery & 2 small properties owned by others). Even the proper name for the estate is in doubt. One map calls it simply "Ivor"; the other map calls it "Chateauiver" (one word) & other sources call it "Chateau d’Iver". Some readers have wondered about Pope's unusual design of the mansion, & its supposed use as a "Hunting Lodge", but let me mention a few things. My property is only a tiny fraction of what was formerly the Chateau d’Iver grounds, & as I write this, it's 106 years after Chateau d’Iver was built. Yet, my property still is home (or at least, a "passing though" area) for chipmunks, large raccoons, bats, opossum, squirrels, hawks, field mice & rats, foxes, all manner of small birds (including blue jays, cardinals, red-headed & other woodpeckers, morning doves, mockingbirds, screech & other owls, & a stray oriole now & then, etc.). I can only imagine what lived on the Chateau d’Iver estate 106 years ago, considering that all of those animals still remain in a suburban area 40 miles from New York City, even though it is still a heavily forested area.